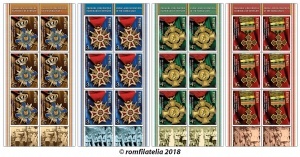 In the Centennial year of the 1918 Great Union, by postage stamp issue Medals and decorations of the World War I, Romfilatelia celebrates the soldiers that fought for the national ideal during the war. 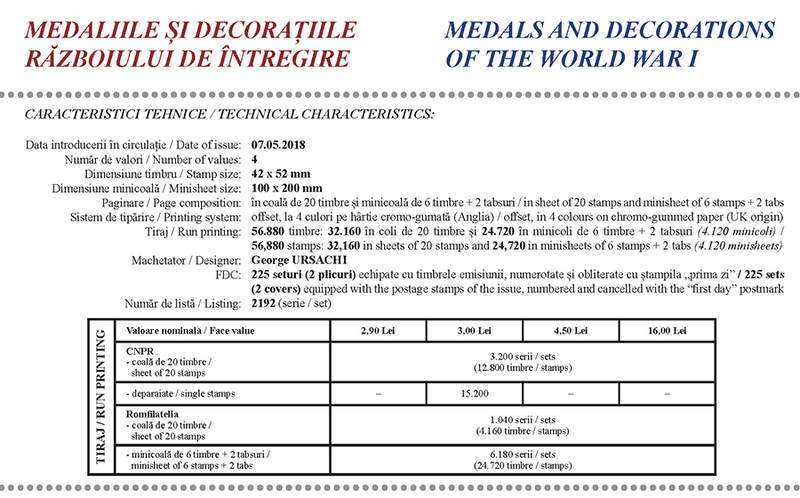 The issue consists of four stamps, which illustrate the most important distinctions awarded to combatants in the World War I: the Star of Romania National Order, on the stamp with the face value of Lei 2.90, the Crown of Romania National Order, on the stamp with the face value of Lei 3.00, the Military Virtue Medal, on the stamp with the face value of Lei 4.50 and the Commemorative Cross of the 1916-1918 War Medal, on the stamp with the face value of Lei 16.00. The Star of Romania National Order was established on May 10th, 1877, having five ranks: Knight, Officer (that had a rosette on the ribbon), Commander, Grand Officer and Grand Cross. It was also awarded with war insignia, representing two crossed swords with the point up, between the arms of the cross. The ribbon was made of red tabby with two blue strips at the edges. The first two ranks were worn on the left chest, the Commander on the neck, the Grand Officer on the neck and chest, and the Grand Cross on trail over the left shoulder and chest. Beginning with April 9th, 1918, for special acts, the Commander, Officer and Knight ranks could be worn with the ribbon of the Military Virtue Medal, that was red in color with a single blue stripe on the edges. The Star of Romania Order is awarded only to officers. The Crown of Romania National Order was established on May 10th, 1881, having the same ranks as the Star of Romania. The Order had no war insignia, and the ribbon was made of dark blue tabby, with a strip in color of steel on its edges. The ranks of the Crown of Romania Order had the same regime of wearing as those of the Star of Romania Order. In 1916, the Crown of Romania Order received war insignia, representing two crossed swords with the point up, between the arms of the cross. Beginning with April 9th, 1918, this order was also worn with the ribbon of the Military Virtue Medal. The most important medal awarded during the World War I was founded in 1880, with the Military Virtue inscribed statement. It had two classes: the 1st class in gold, and the 2nd class in silver. Was intended to be worn with tabby ribbon of blue color with a red stripe at the edges. Both classes were placed on the left chest. This medal took precedence in its category of decorations, and from 1916 was awarded only to the inferior ranks (non-commissioned officers and squad). The Military Virtue Medal was also awarded to women, who could wear it with the ribbon in the form of a bow. From April 9th, 1918, the medal ribbon could be attached to the Knight, Officer and Commander ranks of the national orders Star of Romania and Crown of Romania. The Commemorative Cross of the 1916-1918 War Medal was established in 1918 and was awarded to all military and assimilated personnel, of any kind, that took part in the 1916-1918 campaign and that were integrated, attached or used with various assignments in squads or military services. The distinction was also received by the civilian clerks, as well as by the persons that, not belonging to the army, were called to perform an effective and permanent service for the army. For militaries, the ribbon of the medal was made of tabby, striped, dark blue and green in color, alternating equally, and reversed colors for civilians. For the battles on the different fronts to which the person or squad took part during the war, brass straps were applied transversally on the ribbon, with bronze inscriptions: ARDEAL, CERNA, JIU (TARGU-JIU), CARPATI, OITUZ, BUCURESTI, TURTUCAIA, DOBROGEA, MARASTI, MARASESTI, TG-OCNA etc. On the First Day Cover of the postage stamp issue is illustrated the “Mihai Viteazul” Order, the most important Romanian military decoration. It was established in 1916 and had three classes: the 3rd, the 2nd, the 1st. The third class was worn on the left side of the chest, the second class was worn on the neck (in command), and the first class was worn as a brooch on the left side of the chest. The ribbon was made of tabby, dark cherry-red, with a strip of golden strand on each side. 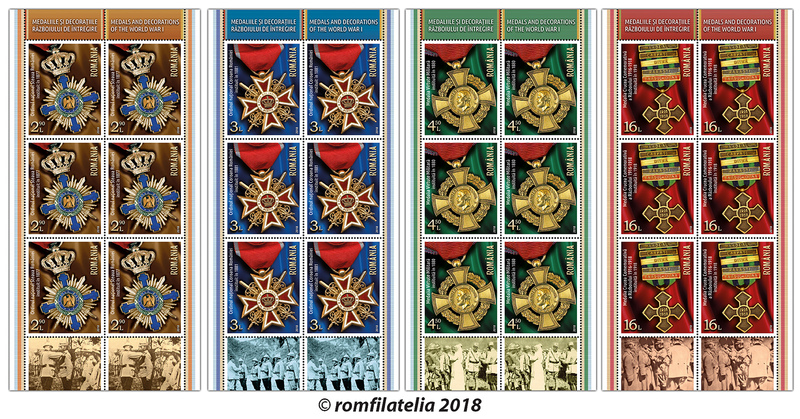 Romfilatelia thanks the professor Corneliu Andonie from the “King Ferdinand I” National Military Museum and the National Archives of Romania for the support granted for the achievement of this postage stamp issue.